What happens when you mow down all of your hay with the hopes of baling it over two days? It either rains or you have equipment problems. Or both. 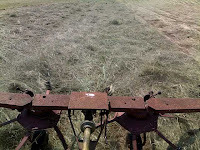 When we ended the day on Tuesday, we expected to start baling as soon as the dew was off mid-morning on Wednesday. By the time mid-morning rolled around, two light sprinkles had already fallen on our 65 acres of mowed hay and the clouds that remained weren't letting the sun shine through. As a result, I spent two hours using the tedder to "fluff" the hay so it would dry off more quickly. The sun finally broke through around 11am and the hay was ready to rake at 1:30pm. After two hours, I had 14 acres of hay raked into windrows. I was only a few minutes shy of moving to another field when I was flagged down by our guy running the baler. "A belt broke on the baler and another one is just about to." Thus ended our plans of baling half our acreage Wednesday and half on Thursday. Wednesday's late start meant that we would not be able to get to the tractor place in time to get replacement belts before they closed for the day. Instead, my dad hit the road after milking this morning so he could be there when they opened. We expect to have the new belts on the baler by the time the dew dries off this morning, so hopefully we'll be baling by 10am. When everything is working right, we can average about 20 round bales per hour. With 60 acres left to bale, we're looking at 8-12 hours in the field today depending on the yield, weather, and equipment. If we're REALLY lucky, the baler won't break down, the heat and humidity won't spawn a thunderstorm, and the evening dew won't fall until we have 200-250 bales of hay rolled up nice and tight. Whatever happens for good or for bad, this hay day is sure to be a long one! Dad returned with the belts at 9am, and I started raking an hour later. 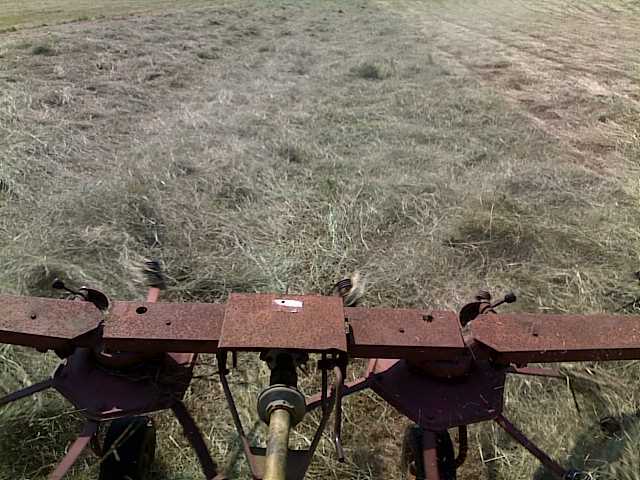 Since we had a heavy dew, we decided to let the hay sit in windrows for about two hours before we put the baler in the field. I pulled up a RADAR image on my phone around 11, and promptly called my dad to say we needed to start baling immediately. As you can tell by the picture, there is a very good chance that we will be rained out this afternoon. The rain system started to fizzle out and went south of the farm, missing us completely. I don't know if it was due to meteorology or miracle, but either way I owe a moment of prayerful gratitude. By 2:30pm the baler rolled up all the hay I had raked yesterday afternoon and this morning. We both moved over to our "big" field (26ac) near Mt. Pisgah Church and went to work. We've just finished with that field and are taking a short supper break before knocking out the remaining 15 acres about a quarter mile from the dairy. Barring any equipment issues, we should be finished between sundown and dew fall. I finished raking at 8:30, and just got word from my dad that he had finished baling. For the day, we rolled up 200 bales of bermudagrass hay (75 tons) off of 60 acres. We've yielded more tons/acre before, but the sacrifice in quantity should be made up for in quality. Late this morning it sure looked as if we were going to be rained out, but the weather really worked out in our favor. Time will tell if we can keep that luck on our side next week when we (hopefully) begin chopping our corn for silage. WOW. This is when you know and SEE that God is on your side! Happy for y'all!!! Handle with care!